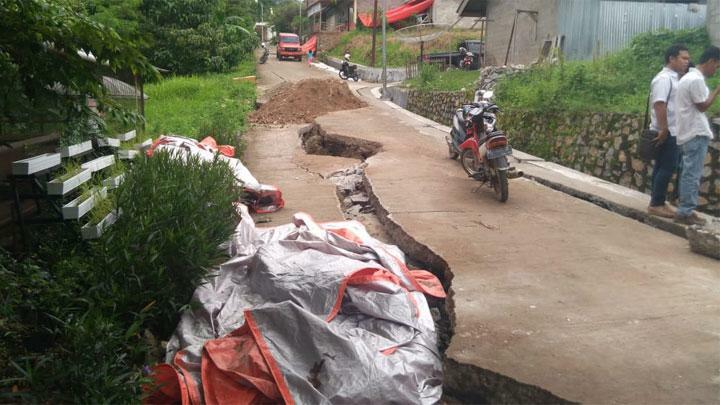 Prominent land cracks were seen in Barangin regency, Sawahlunto, West Sumatra, on Friday following weeks of downpour. The National Disaster Mitigation Agency (BNPB) said the cracks, which were caused by soil liquefaction, had left 16 houses damaged. Twenty-two people were removed from the houses. “A crack is about 40 meters in length. No deaths have been recorded,” BNPB spokesperson Sutopo Purwo Nugroho said in a statement. The agency said the area had been hit with heavy rains since Oct. 11, affecting soil conditions. “The soil liquefaction occurred following the infiltration of rainwater into the ground. Many houses and buildings sustained cracks and became tilted, floors collapsed and drainage was also damaged, Sutopo said. Most roads around the affected area have been closed to vehicles. Sutopo also warned residents to prepare for a possibility of more damage. “It is possible that soil liquefaction will continue and damage more houses and buildings,” he said. The Sawahlunto BNPB has been cleaning up debris using backhoes and excavators.Tents and public kitchens have been established for the displaced.